A girl can dream right? I'm pretty positive that's all I ever do! Since Dad left here 19months ago now, we've been trying to get the garden back to some sort of normal garden! That said, we then decided we were staying here and making it a home for a while so decided we would make it more of a homely garden. However, financial and weather problems have now put this on hold part way through - good job its winter. So this is roughly how our garden looks now. 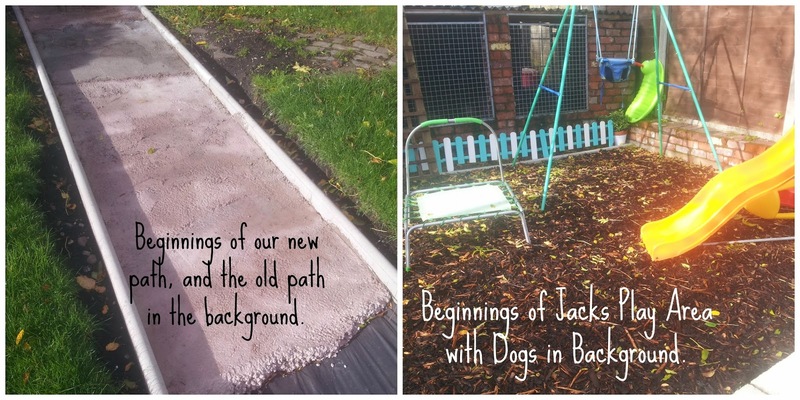 As Jack is now getting older and wanting to play outside more and more everyday - including when its raining, typical boy, I want to ensure its child friendly as well as having a fun area for Jack to play in. I've put my creativity into action and headed to paint to show you all how we wish for our garden to look. We are lucky enough to have an incredibly long garden so can fit in all aspects of what we wish. We have never had a proper patio area so that is one thing we definitely would like, especially if we can have another summer like we did this year. At the moment we have a curved pathway which is partially covered by a shed, so not useful and as it is block-paved a lot of weeds come through which is high maintenance. We also have a flowerbed on the driveway, a small dog area and a vast array of sheds - Dads! We did have a whole garden full of conifers upon the left hand side looking up from the house. We have started to take these out and put in fences again to make it easier to maintain. Our future plans are to extend the area in which the dogs have - they are outdoor dogs whom love lots of space to play. We also intend to move the shed and transfer everything into one shed and move the flowerbed off the driveway to make more room for parking our cars. As for the pathway we are digging this out, laying down a concrete base and putting shale on top of this, and also having it in a straight line down the centre of the garden. The patio area we intend on having will be made with shaped slabs. The main priority from the garden is having somewhere safe for Jack to play, and also large enough to have a vast array of toys for him. We have already begun laying weed control fabric and laying a deep layer of bark for him, and we intend for it all to be like this, with stepping stones to enable us to still get to the top of the garden. We will need to build an undercover storage area to store some of his plastic toys so they don't become brittle in the winter weather. 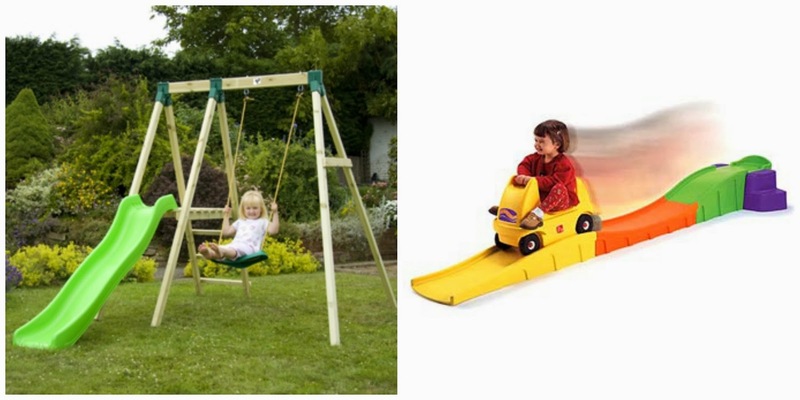 So TOTS100 linked up with Activity Toys Direct and asked bloggers to create their ideal garden with £750 to spend. So this is how I would spend it. Jack already has some lovely outdoor play toys, but I wish to upgrade his plastic items to long lasting wooden ones. We have 2 wooden sandpits, but I would exchange his slide and swing for this lovely TP Toys Forest Single Multiplay from Activity Toys Direct, costing just £199.99. I feel Jack could have great fun playing on this to get his thrills with his big cousin. I also think Jack would enjoy this Step2 Up & Down Roller Coaster priced at £129.99, again as Jack is such a daredevil and thrill seeker I think he would enjoy this. With the remaining of Jacks area I would create a more permanent sensory play area for him to enjoy. So that comes in at £329.98, which with the items Jack already has would make his area complete. So with the remaining budget I would set to complete our area and purchase a lovely Rattan Patio Set, seeing as that is the only set which I love. I found this one for £299.99, and I would purchase some Plum Slate to complete our path which I found some bags priced at £6.99 - we would need a lot though. 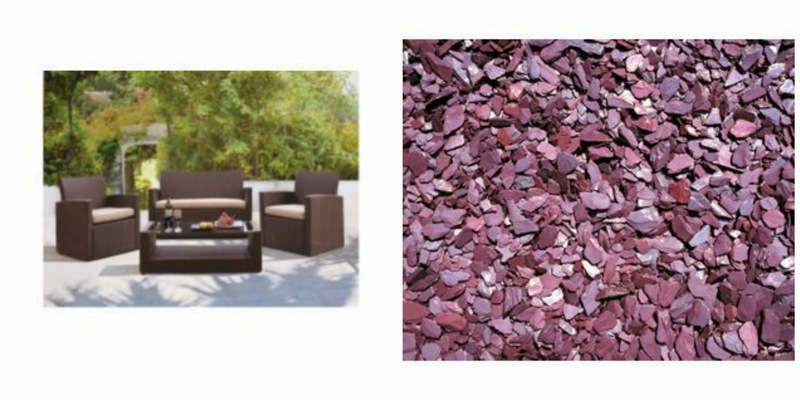 So all in all my ideal garden would come in around £650 that leaves £100 to add some colour with some flowers.